We finished attaching the metal roof and added the base for the floor. You will also notice we added exterior house paint to any wood that was going to be exposed. This will help keep it more weather proof. Our next step is to finish the front facing and then add exterior wall boards to attach the siding. After that we plan to put insulation in between the walls and then close the wall withinterior wall boards, some of which will be pegboard. The floor shown in the picture are pallets resting on concrete blocks and 2X4's. We had to use a crowbar to get them to slide into place but the floor is wall to wall and it's level and firm. There will be 3/4" 4X8 floor boards placed over this to cover the slats and make the floor rock solid. I'll just be glad when we get to the point in this project where I don't have to climb on anymore ladders. I'll expand on the ladder drama when the project is done, I don't want to jinx myself before shed completion. For now, I'm excited it's starting to look like a real building. The one sunny day we had with three people (Thursday) was put to productive use. The intention was to finish the roof by the end of the day but we fell a little short of that. We were however, able to complete the entire roof framework. Two days later, FM and I added the sheet metal until we ran out of metal...and screws. The metal pieces are on special order (we had them cut to size) so we're as far as we can go on the roof for right now. Today we are going to work on picking out pallets for the permanent floor. Visual update on the progress thus far. First we mounted 2x4's on their sides using roof mounting brackets. Then we attached 1x4's using wood screws. We had to build a platform using pallets because the ladders weren't tall enough. The Bear stood watch over the tools (and drinks). Then we added 8x4 sheet metal pieces using special pole barn screws. They have a built in washer and little gasket that seals itself over the hole as you sink it to prevent water leaks. Next week we are going to work on adding a more permanent floor and sealing the exposed wood to make it more weatherproof. After that we are starting on the OSB boards and siding. This shed is starting to come together - finally! We did more work on the pallet shed yesterday. I know, you're thinking "You did?" But if you look closer you will notice we added existing support to the frame. It's completely solid now and we haven't even added interior walls yet. We used overlapping 2x4's to secure the top and bottom layers. Some are mounted with deck screws and every other one is bolted through. FM went around and placed wood shims between the top and bottom layers to prevent swaying in the wall. I picked up lumber and hardware for the roof. The roofing material itself will be metal since FM has a large amount leftover from the building of garage and barn. The sides are still under consideration. Total shed cost so far for hardware and lumber is hovering around $200. Will post final number when complete. This week was pretty productive all things considered. In addition to working on the shed and moving items back out of the house, we finished some loose end projects. We finished the entire front fence. The rest of the yard is on hold right now pending the house completion. We still have to dig out the old fence posts in the front to make the facade look cleaner but this will require some rain. I convinced FM to hire someone with heavy equipment to come out and auger the entire yard and around the pasture area and we could easily stretch the fence ourselves. Stretching the fence is the easy part Digging is another story. The auger keeps going down, the ground is hard as a rock from lack of rain and I was running out of swear words. Quite frankly, I was OVER the hand digging tool thing. We finished off the gravel on the walkway and attached hardware to both gates so you can walk into the barn area and the field without going through the garage. 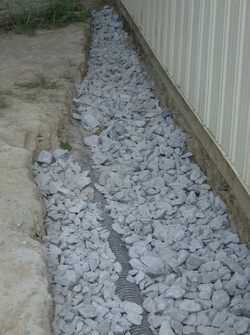 We dug out large rocks and recycled them as a walkway to the utility meter. Once the Iris'a are replanted and recover this will give the meter reader easy access. Either that or he'll just trample the flowers as usual. 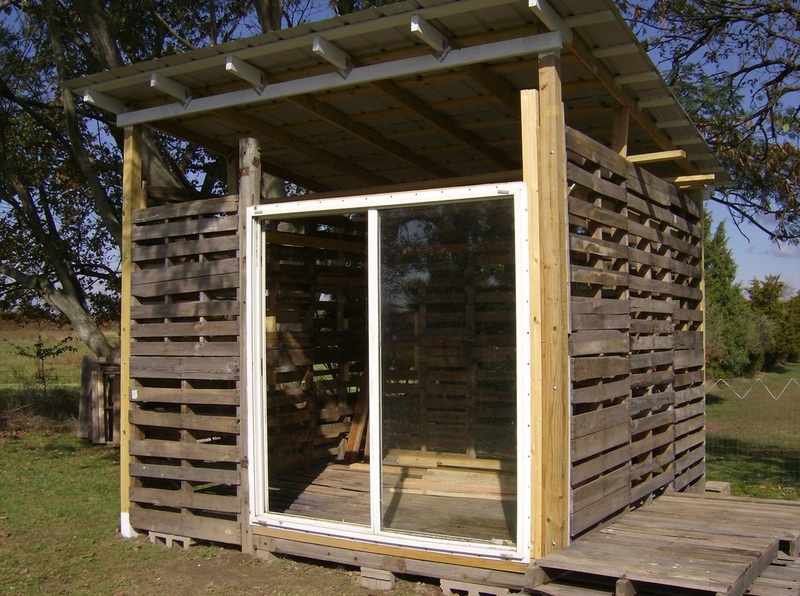 Pallet shed building - fun for the whole family! We started by attaching three pallets together using long bolts and washers. Pallets are made of varied types of wood but the "skids" (the three solid pieces you see running length wise) are always made of oak. This is where you want to drill holes and attach the bolts. You need a real drill for this, not a cordless (laughably wimpy against oak) so if you didn't inherit an industrial one from your Grandpa be prepared to buy or borrow one. Drilling the holes, believe it or not, is the hardest part. Oak is like a rock. Then you lift the entire "wall" and mount it to your corner posts (we used pressure treated 4X4's). The site I used as a reference doesn't use corner posts, he anchored his to the ground using rebar but the corner posts make the walls more solid and a lot easier to attach. It took us most of the day on Saturday to get the first level walls built and attached to the frame. By then we were all burned out (literally) and decided to finish the next day since the heat was taking a toll. The first level is where you learn the most - meaning you make the most mistakes - so it takes a bit longer. On Sunday we attached the second level. Bro and I debated whether or not to attach one pallet at a time or follow the instructions and attempt to connect as one wall unit. For the record, these suckers are heavy! I've got ample girl power going on but lifting this whole wall above my head was testing my confidence a little. We finally devised a plan to use the truck as a scaffolding, lift the wall onto the back of the truck, stand inside the truck bed and lift it the rest of the way. It worked like a charm. By the time we were attaching the last wall, it started to pour down rain. We decided to break for lunch at this point. Then the rain stopped and we hurried to complete the frame for the roof. This also required standing on top of the truck because the highest slope of the roof is 10 feet high and using a drill on a ladder - eh, not so easy. By the end of Sunday, the entire frame was complete. We have a two foot pitch from front to back to allow water and snow run off. Then it was time for Fearless Bro to return home. He left us with his trusty cordless drill since the hardest part requiring "manly" strength is done. We still need to complete the roof, the siding and build a door frame. Then we plan to build customized tool shelves using the leftover pallets. So we still have a ways to go before completion but I'm pretty pleased with the structure we have so far. We broke ground for the pallet shed this week. Fearless Mom and I started to lay the corner posts and the first one was a cinch, the second one was not a cinch and then after that the auger went down again (insert long stream of swear words here....) So we are back to digging the remaining posts by hand and after several months without a drop of rain, the ground is hard as a rock. Luckily we only have to go 2 1/2 feet for each one but this is still gonna take some time. Two up, four to go. This is going to be the back end of the shed and the bricks are being used as floor support. The finished dimensions are going to be (roughly) 10 x 10 with a sloped roof and siding to make it more weather proof. The concrete blocks will provide a floor elevation of 8 inches (roughly) to keep water out. 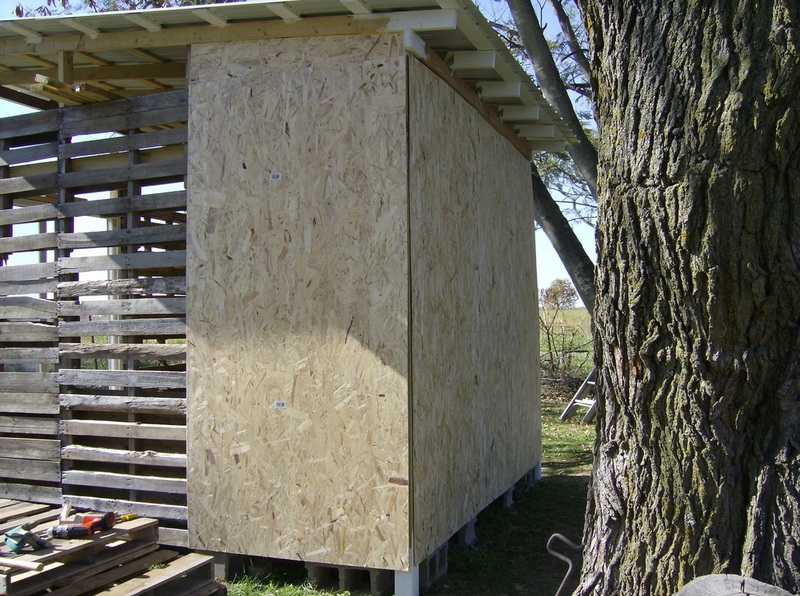 FM has not decided yet on whether she wants to use wooden barn siding or aluminum siding but obviously, she has some time to make that decision. For now, we still have to conquer the dry earth. We completed the fence at the pasture side of the yard but were disappointed in the choice of gate location which was originally placed near the garage door. We discovered that once we put the fence in it created a rather narrow walkway that was awesome for people traffic, not so good for horses. The Pretty Pony immediately got herself stuck and unable to turn around and in a small panic started to shove against the new fence in an effort to get herself turned around. Horses can walk backwards they just kind of prefer not to and in her case, she acted like it was nearly impossible. Concerned she would break down the fence we just sweated our butts off to put up, we decided to move the access gate to the wide end. The only problem was I had already set the gate post securely into the ground and we now had several tons of gravel to drive a post through. It was never gonna happen. Arrrrgh! So we installed a SECOND fence at the wide end and using creative genius (if I do say so myself) used a pallet as a prairie gate using two recycled hinges we found in the tool shed. We still need to install a latch but the fence works perfectly. The most tedious project - done! We got the auger back and have the front fence almost done. The walkway and driveway gate are permanently hung and fence stretched across the front yard. But most importantly, we finished trenching out the drainage ditch next to garage and got it half filled with baseball sized rock. FM has a local rock quarry right in her town so getting any kind of rock or concrete product you want is convenient and super cheap. The longest part was just getting the damn trench dug. So we dug this entire thing out by hand - over 30 feet long, two feet wide and almost three feet across in some places - with a freaking hand shovel! Don't even get me started on what it's like to hand shovel 3 tons of baseball sized rock out of the truck. The large rock filled the bottom but to top the rest of the ditch off, we needed to fill with smaller gravel and extend this into the driveway to make one long continuous area. This was going to take significantly more than one pick-up truck worth so we called in the big guns. Armed with 15 tons of gravel. And he promptly backed into the garage and left a dent. But at least the driveway and drainage ditch are pretty much done and our digging days are behind us. Uh, that would be only the trench digging days!